We looked high and low for just the right one, and even tried many out for size, durability, look, responsiveness to different sizes and weights of cargo, and more. When this jewel came along, we knew it was just right. It has a bottom so that your stuff doesn't poke out in an unsightly way. The handles are in the right spot so that it doesn't disfugure when you carry it. The black sides look super smart and not boring like plain canvas bags can. It doesn't have a goofy, psuedo-modern shape either: it is well-proportioned, sleek, clean, expansive, and impressive in every way. And so we've had it emblazoned with the Mises Institute logo. The message? Well, it says liberty all over it: scholarship in the defense of liberty. It has bound sides, an outside front pocket, 5" full side gusset, and cotton handles finish 26" long. The bag size is 14" x 14" x 5". When the employees at our warehouse saw it, they all wanted one. Then they had an internal betting pool on the retail price. Most guessed $20-30. Nope: $10. This tote bag consists of two colors, a dark black and a beautiful off white. These colors compliment each other very well, living up to the "sleek, clean" look described in the product description. 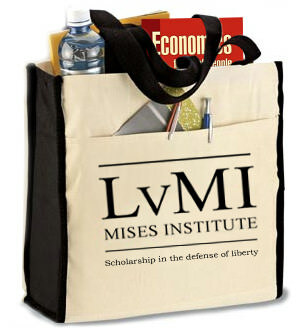 The text is also sharp and professional, whether or not someone knows what the Mises Institute is, carrying this bag around will make you stand out in a reputable way. I am currently using the back for college, which means that the bag is holding 4 books and 4 journals, as well as a calculator and other smaller accessories such as pencils. It is well built and I have no reason to think that it will rip or break on me anytime soon. I will bet that I will get at least a couple years out of it, and that is if course just my amateur estimate, it may last longer and I hope it does. If not, I will get another! from New York, NY Great bag! The bag is good quality and the front pocket is a nice feature. I use it to tote around my knitting and I am able to easily store my patterns in the front pocket. I also use it as a bag for carrying around my Rothbard and Bastiat books, of course.